Plantlife have now added their Wildflowers Count data to iRecord. Wildflowers Count is the UK’s only annual national wild plant survey, and it aims to record common species as indicators of the health of our countryside. There are three different types of survey that volunteers can take part in, and records can be entered straight into Plantlife’s website using their Indicia online recording system which is now linked to iRecord. Wildflowers Count has already produced over 30,000 records of over 861 different species, such as meadowsweet, lesser celandine, cowslips and red campion, and Plantlife are now inviting volunteers to sign up for the 2013 Wildflowers Count. For more information about Wildflowers Count visit http://www.plantlife.org.uk/things_to_do/wildflowers_count . PondNet is coordinated by Pond Conservation in partnership with Amphibian and Reptile Conservation with support from Natural England, Biological Records Centre, BSBI, BTO, British Dragonfly Society, Freshwater Biological Association and Amphibian and Reptile Groups of the UK. 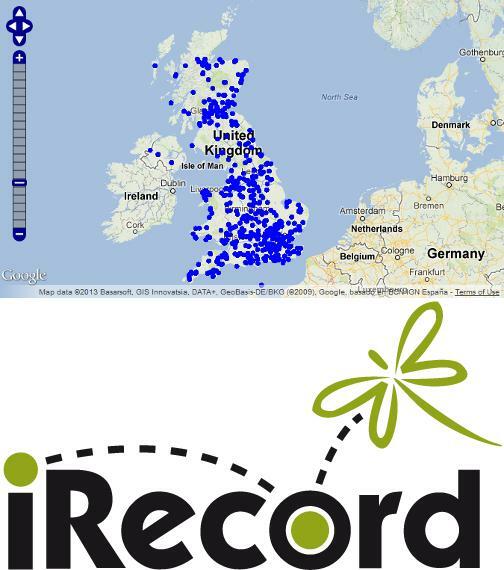 Two iRecord users have now both recorded over 1000 different species on iRecord! To find out who these champions are, visit iRecord and look at the Recorder League Table. Can you challenge them this year? iRecord now has a new form for recording ladybirds. Records entered using this form are sent straight to the UK Ladybird Survey. You can find this form and add it to your favourites by logging into iRecord and selecting ‘My Forms’ under the ‘Record’ tab. The goal of iRecord is to make it easier for wildlife sightings to be collated, checked by experts and made available to support research and decision-making at local and national levels. iRecord incorporates NBN Record Cleaner rules and there is a regular flow of verified data from iRecord to the NBN Gateway.